A coming-of-age story in which Lesley (who desperately wants to be called Lisa) takes a job in a tres chic department store while waiting for her exam results. Based on a book, Ladies in Black takes a peek behind the dressing room curtain of the impossibly glamorous women who dressed the well-heeled women of Sydney. This is such an enjoyable Aussie film but man it was hard for me to pay attention to anything else but the fashion. Because OH MY GOD THE FASHION. 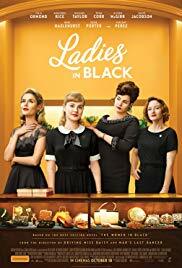 A visually sumptuous film about an innocent time in Australia’s history when department stores were all about providing first class service, and every immigrant was considered a “reffo” (refugee) no matter how bloody fabulous they were. I found myself taking turns sighing with love for the dresses and smiling from ear to ear for the story.